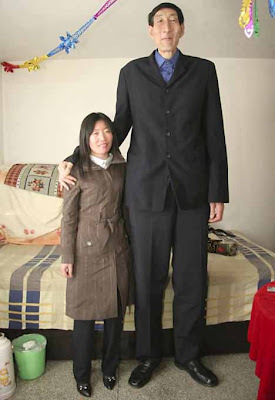 Measuring a towering 8 inches taller than the previous record holder, Bao Xishun at seven feet nine inches, Ukrainian Leonid Stadnyk has now officially become the world’s tallest man standing at 8 feet 5 inches tall. Previously, the 37 year-old former veterinarian has always refused to be officially measured for the Guinness Book of Records as he detests his height and didn’t want the fame and notoriety. Leonid Stadnyk, from the small village of Podoliantsi, Ukraine describes his height as ‘God’s biggest punishment for me’ and refuses to look in a mirror. Leonid’s first years 14 years of life were rather contrary to his lofty present height — in fact, his nickname in school was ‘titch’ due to his short stature, being one of the smallest boys in his class. At the age of 14 he underwent an astonishing growth spurt after surgery on a benign brain tumor which stimulated his pituitary gland, which is responsible for stimulating the production and overproduction of growth hormones. Forced to sleep on two beds joined together lengthwise, Leonid weighs about 450 pounds, has 17 inch feet, and gargantuan palms measuring more than a foot in diameter. Despite determined attempts by the Guinness Book of Records to officially measure him for the past three years, Stadnyk had always refused until he met London growth expert, Professor Michael Besser from the London Clinic Centre for Endocrinology. 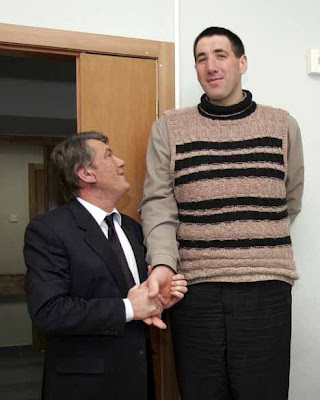 Besser was surprised to find that the brain tumor which had haunted Stadnyk for more than 20 years had naturally died off, saving Stadnyk’s life and putting an end his peculiar growth spurt. Professor Besser’s discovery was filmed for a documentary on the Discovery Channel in December last year. The revelation led exposure to the world of his amazing height after it was measured officially in Kiev. 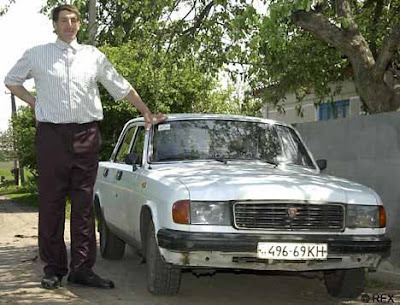 Stadnyk has been added to the record books in America, but the 2008 Guinness Book of Records won’t be published in the UK until September 28 2007. Leonid Stadnyk currently lives with his mother in a confined 3-room, one-storey home in Ukraine where he has to contort his frame to enter through a doorway. 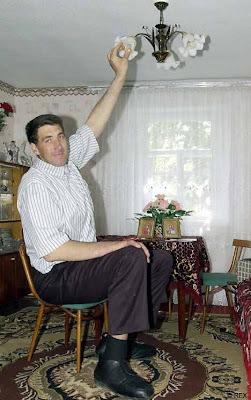 Leonid was forced to quit working on a cattle farm six years ago after his feet became frostbitten when he couldn’t afford to buy a pair of specially crafted size 27 shoes which cost $200 — the equivalent of seven months’ worth of his pension — for his enormous feet. 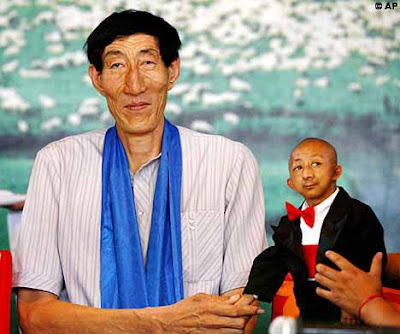 The former record holder Bao Xishun was recognized as the world’s tallest man last year, beating the previous record holder, Radhouane Charbib of Tunisia, by a mere 2 millimeters. The tallest man ever was American Robert Pershing Wadlow, born in Alton, Illinois on February 22 1918, last measured at 8 feet 11.1 inches tall on June 27 1940. This news cast is in Deutsch. (Thanks to Sidzilla for correcting me. ) If an English one becomes available I’ll update this post.